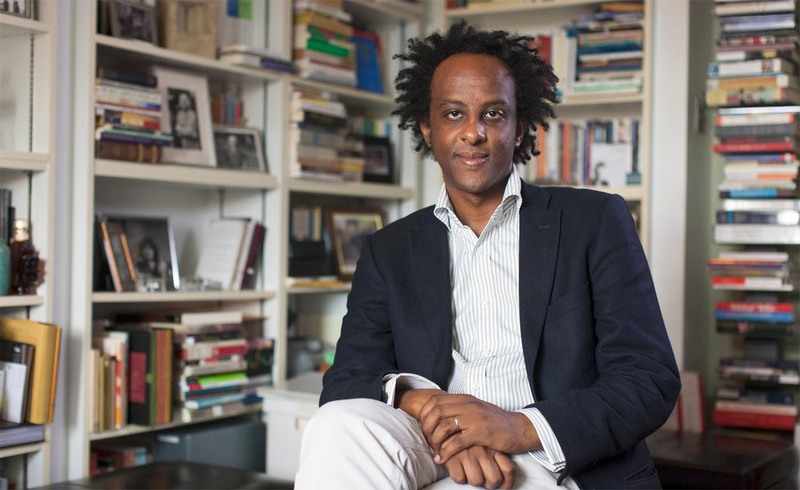 Dinaw Mengestu is most recently the author of All Our Names. Subjects Discussed: Writing from a woman’s perspective for the first time, V.S. Naipaul’s A Bend in the River, delving into the perspective of revolutionary turmoil, Mengestu’s American perspective, how journalism helped Mengestu to pursue more serious areas in literature, “soft” fiction vs. revolutionary realities, working with alternating chapters to create narrative collusion, the shame of being impoverished, sustaining an existence on lies, the effects of trauma, when novelists writing about the other avoid abrasive fictional perspectives in the interest of attracting readers, quiet introverts in fiction, why Mengestu hasn’t written about noisier immigrants, aesthetic sensibilities, loud vs. quiet characters, imagining trauma, Mengestu’s experience of writing about characters who felt trauma before he was born, the appeal of characters who experience extreme forms of political crisis, ventriloquist-style novelists and humanism, Saul Bellow’s The Adventures of Augie March, exuberant characters, being tagged with the “immigrant fiction” label, deliberately keeping time and space murky in All Our Names vs. the close attention to Logan Circle in The Beautiful Things That Heaven Bears, the timelessness of discrimination, emotions summoned through general descriptive specifications, resisting the urge of writing a novel set in an unnamed country, the problems with naming too many things, the limitations of looking at events through a historical prism, unspoken American prohibitions against political fiction, politics in fiction without didacticism, European encouragement of political fiction, constraints imposed on American fiction, creating an artistic space within fiction, Mengestu’s sense of aesthetic value, arguments that books make for ways of seeing, living with hand-me-downs, how Mengestu’s characters express emotions through giving gifts, materials used to express emotional connection to other people, Emily Dickinson, monuments of America, holding onto emotion in a narrative using objects, when the personal and the political overlap, personal maps vs. political maps, having an internal map of someone you love, concrete political realities, the fluidity of love and how political realities shape it, Helen’s relationship to her parents, the rigidity of place, rituals shared by couples, relationships and silence, situations in life when words are less valuable than intimacy, language provoked from silence, silence as the ineffable pain of not knowing how to communicate, how to measure silence, the mysterious character of David, Edward Snowden, writing in a proto-surveillance state about people who watch other people, Michiko Kakutani’s review, Evelyn Waugh, Brideshead Revisited, A Handful of Dust, Rilke, what contemporary fiction does with the brazen perspectives of colonial literature, working against Naipaul, Joseph Conrad, Lord Jim and the “great game,” Tayeb Salih’s Season of Migration to the North, wrestling with postcolonialism, Ngugi wa Thiong’o’s idea that there are no postcolonial errors, finding an aesthetic balance in a sentence, being a slow writer to find rhythm, and the benefits of memorizing poetry. Correspondent: Because there is an Isaac and a Not Isaac. And it’s also the first to really depict this Naipaulian tableau of what seems at first to be an unnamed African country in revolutionary turmoil, almost a response to the allusion you made to A Bend in the River in the first book, The Beautiful Things That Heaven Bears and also the lies that Jonas is spinning in How to Read the Air. So I’m wondering why it took you three novels before you could write partially from the perspective of a woman and also from this position of revolutionary turmoil. I mean, I’m curious how the first two novels led you to this particular point. Because I read all three of your novels and I thought this was a fascinating evolution. Mengestu: Yeah. I think that was almost perfect. One of the best readings I’ve ever had of all three books. They are very closely intertwined. And if anything, even though this is the last book of the three to have been written, in some ways it actually precedes the other two. This was the book that actually precedes the revolutions that make the characters in the first novel and in the second novel flee. And so I wanted to go back to what I thought would be an earlier moment in history. A point that would say this is actually that very elusive, optimistic period just after independence when things seemed like they might turn out great in many African nations and then they didn’t. And the other thing was that after writing the first few novels, I realized there’s another part of me that I’d never really had a chance to explore in fiction, which was to write from the point of view of an American. Because I’m also, I think, deeply American and I grew up in the Midwest after leaving Ethiopia. And so Helen’s voice, I think, is partly a product of that. My novels oftentimes have been categorized in terms of immigrant fiction. To some degree, this is also perhaps a subconscious response to that idea, to say, Well, look, it’s not. Those categories are very limited and don’t actually say that much. And, in fact, here’s a way of seeing that narratives such as this are more than just immigrant friction and that immigrant narratives are very much a part of an American tableau. And you can’t micromanage them or faction them off into ethnic or political categories like that. And so Helen’s voice, I think, is my response to that. She is an American woman. She’s in many ways more intimate to me than the characters of Isaac are. Correspondent: Was it easy? She’s a young American. She’s still trying to figure out how people work and how relationships work and where one’s place is in the universe. And I’m wondering why a woman’s voice was the best way for you to really show to yourself and show to the world that you were, in fact, an American as well. Mengestu: You know, it’s definitely because I wanted Isaac to have a relationship with someone. So the novel, when I first began it, I never knew that it would necessarily have a part in the United States when I first started writing it. I was very much concerned about trying to capture this period in Africa’s history. I thought it would be about a group of friends in postcolonial Africa on a college campus. And then as those voices started to converge around the characters Isaac and Not Isaac, I began to realize, well, of course, inevitably there was going to be a second half that took place in America. And inevitably you’re drawn to the most complex relationships and the relationship between a couple that’s almost always the most complex. You know, friends are, of course, complex. But I wanted a love story as well in this story. And, of course, if we have Isaac and I had created Helen to follow almost immediately afterwards. And in some ways, you know, I’m not — I never really had any anxiety about her gender. In some ways, she emerged into the story as quickly as the voice of Isaac did. And so as soon as I had Isaac coming into America, I realized Helen was the one to witness him first. She was the first person to see him enter this landscape and to acknowledge him and to become close to him and to kind of help create a sense of home for him. So, yeah, she just was immediate and necessary. Correspondent: And just to delineate to our listeners, who are probably listening to this turmoil and wondering what’s going on, there is an Isaac that is in the Helen chapters and there is an Isaac and what we’re calling a Not Isaac guy who goes by several names ranging from the Professor to a number of other noms in the other thing in these alternating series of chapters. I want to go back to the first question about looking straight into the face of revolutionary turmoil. This book seems to me to be the one that is the clearest. It’s not doing so through any kind of lying. It’s not doing so through any kind of anecdotal family episode or anything like that. It’s trying to stare at it in the face and, at the same time, doing so where the names themselves are not explicit. They’re more common noun than proper noun. And I’m wondering why it took you three novels just to really look at that in the face and confront it like that. Mengestu: I think some of it was gaining more experience as a journalist. Mengestu: It really did. And I never actually thought of myself as having that much of a dialogue between what I do as a journalist and what I do as a novelist. So my first novel touches briefly on the revolutionary politics of Ethiopia. But never having experienced those politics, I had to imagine a character who had experienced them at a very young age and then left the country. In my second novel, the characters are basically inventing those stories of revolutionary Africa because they were born in America. Now, having traveled through Darfur and the Eastern Congo and Uganda, and having met revolutionary leaders and having seen first-hand the effects of these small-scale and sometimes very large-scale conflicts, they all left a deep profound impression on my mind. And some of those impressions worked their way into the second novel. But I don’t think I had enough time to really sit with those images with a while, to really kind of let them become a part of my imagination. So by the time this novel began, I knew the terrain intimately. I knew the consequences of those conflicts. And perhaps more importantly, I felt like I knew how to create characters who could be responsible for violence, but were not strictly evil men. That to me seemed really important. I’ve met a lot of men who I knew were perpetrators of the violence, but at the same time you realize that to describe them or to limit their characters to only horrific terms denies their complexity. And so I felt finally mature enough and able enough to create characters who were responsible for violence, who witnessed violence, who are perpetrators of violence, and yet at the same time are more than just violent men. Correspondent: Do you find though that having confronted so many revolutions and so much violence in your journalism that fiction is somehow cheapened? That anything you can contribute from the American vantage point is somehow sanded down? Because you do have a great subtlety with much of the prose, which is not to say that there aren’t things exploding not necessarily politically, but also personally. How do you reckon with the intensity of something like that? Or do you feel that fiction naturally needs to be a little softer in the presentation of these human nuances? Mengestu: I actually feel that fiction does a better job for me. I think that what you can do as a journalist in the very limited space and time that you have to write one story is that you can tally up the consequences in a very linear fashion. But I think in order to have readers actually experience that level of violence on a scale that doesn’t feel purely remote to them, I think that’s one of the things that fiction can do. In writing this novel and having these oscillating chapters between Helen’s voice and Isaac’s voice, part of the intent was definitely to see what happens when you place these two narratives next to each other side by side. If it isn’t possible to see them as not wholly distinct stories or wholly distinct experiences, but actually narratives that are in constant collusion and constant discourse, the experiences of someone in Africa don’t necessarily seem that remote from the experiences of a white woman in middle America. And that in fact these characters, especially when you reduce it down to the scale of individual characters, so that Isaac becomes the embodiment to some degree of that violence and he takes that violence and brings it to America. And it’s relived, reimagined, when it’s passed onto Helen. And it seems to me that fiction is the space that allows us to do that. Imagining these characters, I thought that I could actually get into their lives in ways that I never could when I was writing journalism. I could imagine the men that I’d met in greater detail and give them, I think, a greater level of emotions than they would ever have given me as a journalist.